(Nanowerk News) Chemists from Europe’s Graphene Flagship review the potential for graphene-organic composite materials in electronics. The researchers show how organic semiconductors can be used to better process graphene, and to tune its properties for particular applications. 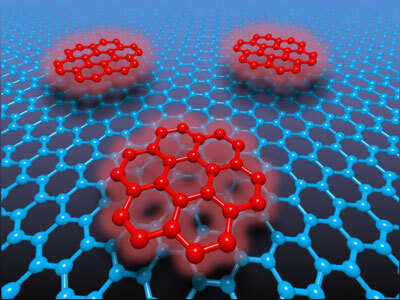 Schematic representing organic molecules attached to graphene, weakly interacting with the 2d material through supramolecular interactions (Image: Vincenzo Palermo/CNR-ISOF). Scalable processing and functionalisation of graphene is the subject of a feature article by three Graphene Flagship scientists writing in the Royal Society of Chemistry periodical, the Journal of Materials Chemistry C ("Graphene–organic composites for electronics: optical and electronic interactions in vacuum, liquids and thin solid films"). The Graphene Flagship is an international consortium of academic and industrial partners, part-funded by the European Commission, which focuses on the development of graphene and related 2d materials.